DO YOU KNOW THE TRUE EFFICIENCY OF YOUR BOILER HOUSE? ARE YOU ABLE TO ACCURATELY TARGET YOUR INVESTMENTS TO OPTIMISE YOUR STEAM PRODUCTION? Often overlooked or assumed, the efficiency of your boiler represents a financially attractive opportunity to make substantial energy savings and reductions in CO2 emissions. Even a small improvement in boiler efficiency can realise significant savings over your boiler’s operational lifetime. Over a typical 10 year operating period of a boiler, a misunderstanding of boiler efficiency can accumulate to represent over $5 million of missed potential savings. Calculations based on 10 tonne boiler, operating at 10 bar g, feedwater at 80°C, operating for 6000 hours per year, Natural Gas at $4.93/kWh (based on average Gas price in 2013 according to International Energy Agency publication representing 29 member states). How should you measure boiler energy efficiency? Many boiler operators use burner efficiency to indicate the total efficiency of their boiler. However, this ignores many potential energy losses that can occur after the burner, such as scaled or dirty heat transfer surfaces or excessive boiler blowdown rates. The only way to obtain the real boiler efficiency is to meter all of the energy into the boiler (in the fuel and feedwater) and compare this with the useful energy out of the boiler (in the steam). Boiler Energy Monitors such as Spirax Sarco's B850, provides an economic and convenient way for boiler operators to measure actual boiler energy efficiency. Flow computers take data from fuel, feedwater and steam flowmeters to calculate the energy efficiency of the entire boiler system. These units should display real-time and historical data to provide an easy way to spot drops in boiler efficiency and identify their causes quickly. Issues such as inefficient boiler blowdown procedures, degradations of insulation or a system failure (for example, in heat recovery equipment) can be tracked quickly. Using only burner efficiency data, such changes can often go unnoticed until an expensive fuel bill comes in. Energy Managers and Facilities Managers are using the Boiler Energy Monitors to benchmark the efficiency of boiler settings and operating procedures. This is helping them to target new energy and cost saving investments and upgrades, and immediately monitoring and obtaining proof of the return on that investment. The Spirax Sarco B850 delivers all this insight in a single, cost effective package, avoiding the need for large investment in a supervisory system such as a Building Management System or SCADA (Supervisory Control and Data Acquisition) installation that entails complex integration. The B850 offers a flexible solution for monitoring energy transfer throughout the Boilerhouse. 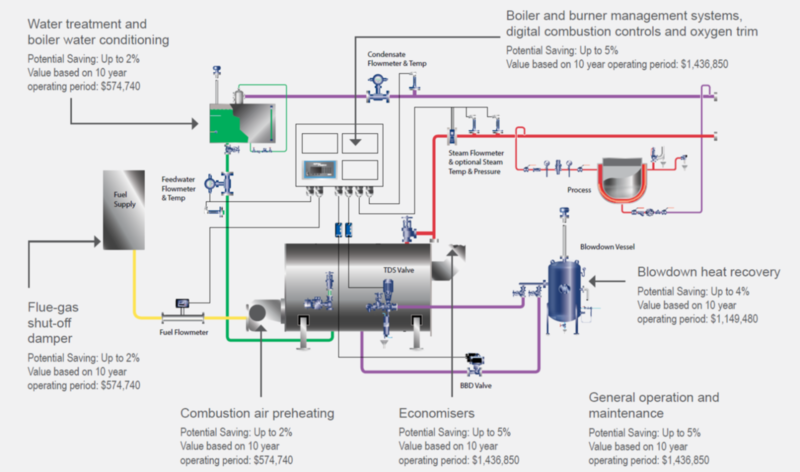 Learn more about boiler efficiency and combustion in our Steam Engineering Tutorial. 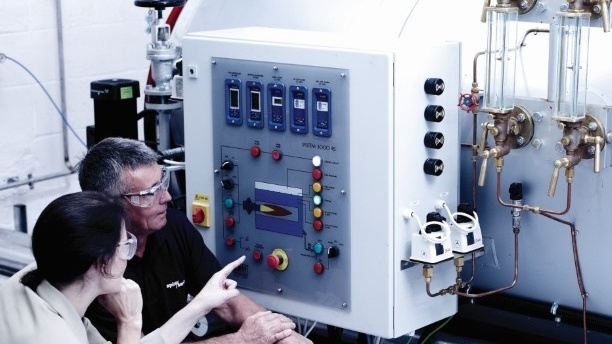 Our Steam Engineering Tutorials give an overview of the combustion process, including burner types and controls, and heat output and losses to help you gain insight into an essential component of the overall effeciency of your boiler.